I'm working up the lyrics to a new song called "Boatyard Blues" to the tune of Jim Croce's "Working at the carwash blues". 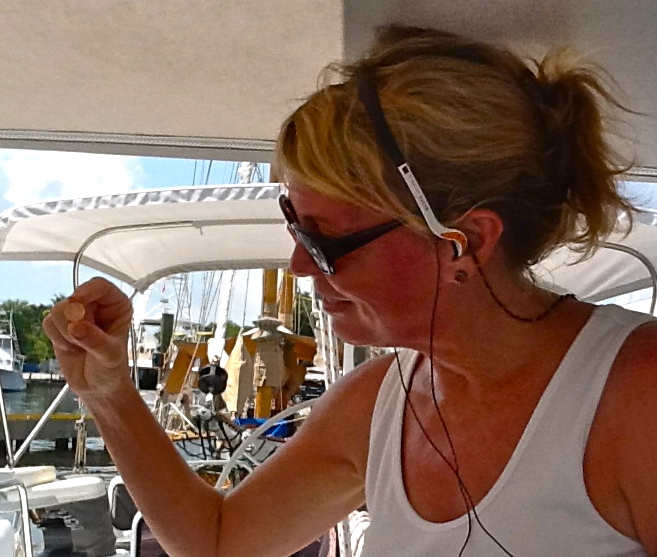 But till that's on the charts with a bullet, we'll continue with our boatyard chores. 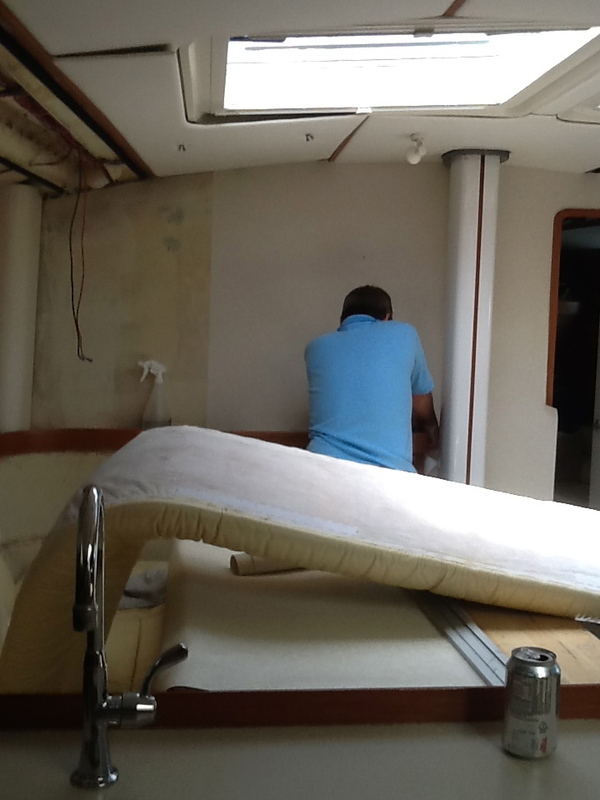 Here, you can see our chief seamstress, addressing some boat-beautification projects for the guest staterooms. I don't know if we mentioned in earlier posts, but Moonshadow came equipped with a sewing machine. Deb's handiwork can be seen in this picture of one of the two guest staterooms you might call home for a bit whenever you drop in on Moonshadow. When you come, you will also know our roots are in San Diego as we've finally adorned Moonshadow's transom with our hailing port and the San Diego Yacht Club's burgee. But that was the easy stuff. Now we're on to industrial strength refitting. For the last two days Moonshadow has looked like hand grenades have exploded below decks. We've had Peter Fine aboard hanging new wall paper in the salon and galley, soon to be followed by work in the staterooms. 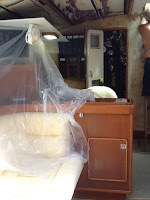 This requires everything be removed from the bulkheads (aka "walls") and removal of the headliners (aka ceiling) which makes the interior dark and hard to navigate with drop clothes, buckets and tools all around. 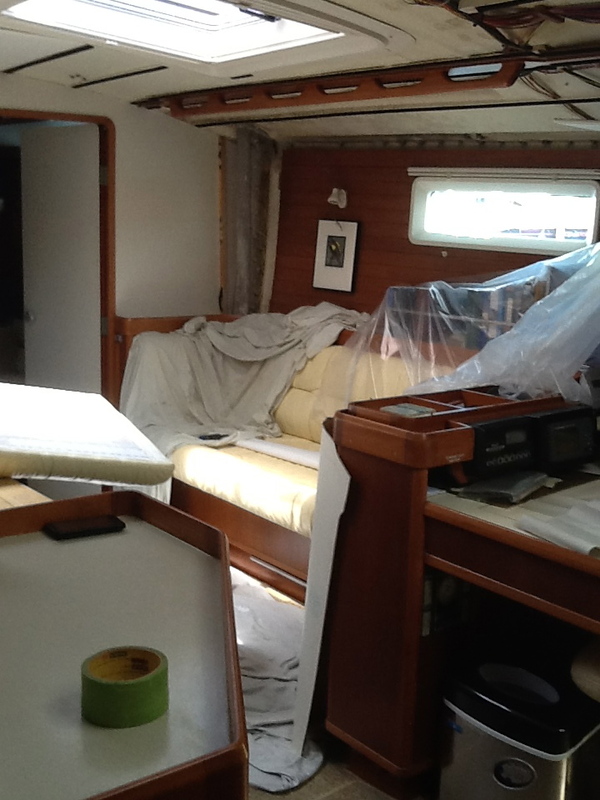 But Peter is doing a marvelous job and the boat will look like new when we're done. 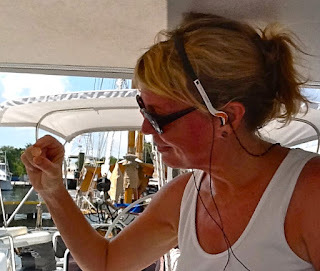 Next week we'll have a different crew aboard with a different set of grenades, outfitting Moonshadow with the latest in radar, chartplotters, autopilot, sailing instruments, and something called an AIS transceiver, which is like an aircraft transponder. 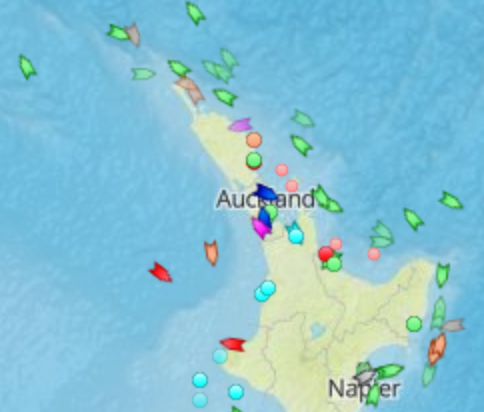 AIS will cause Moonshadow to appear on comercial ship's chartplotters, whether or not their radar picks us up. AIS links to our radiotelephones, so it will also allow Moonshadow to call a ship's bridge directly and they'll be required to answer (something not all ships do when hailed on standard frequencies). Finally, AIS will display a distress call by Moonshadow on all nearby ship's bridges and their assistance thereby becomes a requirement. Seems like a great investment. While all of that is going on, we've made friends from the North Sails loft here in Ft. Lauderdale who will be aboard Monday to measure Moonshadow for a new genoa. They came over last week to take all of our sails to the loft for minor repairs and inspections. It was determined that it is time for a modern, Spectra genoa. Spectra is a near zero-stretch sailcloth that will make one sail perform the function of two dacron sails. We hope to have a sail that can handle 30-35 knots (with reefing), and still be big enough to reach off in lighter wind and keep our performance up. Can't wait to see this. Meanwhile, Moonshadow's Max-Prop is still up in Seattle being rebuilt to recover from the 25 years of spinning around the world. When that's done (about May 14th), and it's shipped back to us, we'll move ashore to a motel while Moonshadow is hauled out, put "on the hard" and gets her bottom painted (black of course). 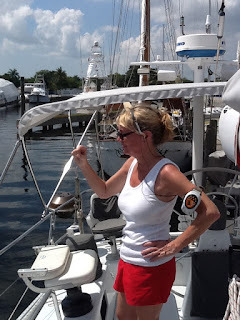 Then we'll launch Moonshadow and head north! Getting a little cabin fever, Deb chose to go for a run in the nearby graveyard (actually a very pretty setting). She came back with a shiny penny she found right in her path at the start of her run. We always treasure the pennies we find (and we're always finding pennies, and they're always right in our path) because the way we see it, Dusty has arranged for us to find them. It was one of his favorite ways to mess with us when he lived at home, and of course when accused, he always denied it, then turned and giggled as he walked into another room. Tonight, we launched the dinghy, thinking a cocktail cruise would be a great break from the boatyard blues. We saw Diva, a sistership to Moonshadow that we'd seen before buying Moonshadow, and another of Steve Dashew's designs Gaia, a Sundeer 64. 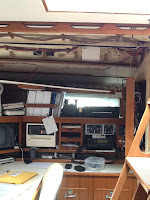 All was fine until the outboard motor stopped pumping cooling water. We were a good 3/4 mile away and drifting down-river away from Moonshadow, when some friendly faces asked if we'd like a tow. This offer was gladly accepted as was our offer to provide drinks aboard Moonshadow upon our return. Thus, we finally had our first official guests aboard Moonshadow, and our first test of the new icemaker, which came through with flying colors. Legacy never ran out of ice and by God, neither will Moonshadow! Our saviors were David, Jonathan and Zara, part of the crew of Lady J, a 170' yacht. Jonathan and Zara are a couple and crewed aboard different yachts so they were only able to see each other after stretches of weeks or months apart, until finally landing a job together aboard Lady J. It was fun to learn about the lifestyle of these young people who've chosen a life cruising the world, serving wealthy owners and or charter guests on occasion, but mostly playing with beautiful yachts in unbelievable exotic ports when nobody's aboard. Kinda makes you wonder why we chose to do all the work for nothing and pay all the bills!